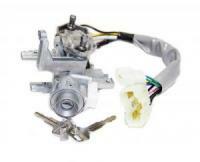 Replace your worn out Ignition Lock assembly complete with Ignition switch and two spare keys. Fits DA62T, DA63t with MT Transmission. Include Chassis Number when ordering.